When we discuss the core, we mean the trunk and the core muscles around it that support it. A stable core is one that doesn't sag or sway when the movements are performed by the arms, legs, or larger trunk muscles. Stability can be defined as your ability to control movement of a joint around a neutral zone. Movement in this zone is accompanied by minimal resistance by soft tissues. Movement outside this zone is limited by ligament and muscle length and can be accompanied by discomfort due to stretching of these structures. Spinal instability can lead to back pain, poor posture, arthritis, disc degeneration, and nerve root irritation. Spinal stability is dependent on the structure of the spine (the boney alignment, and the ligaments that hold each segment together). 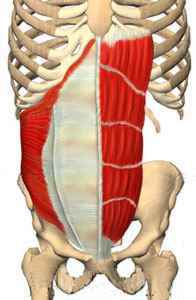 The muscular support actively holds the spine in an optimum position (neutral position). These muscles are designed for quick, powerful and explosive movements. Their capacity for endurance or sustained activity is limited due to their muscle fibre type composition. Therefore, their capacity to provide core stability is limited. By their fibre type the core muscles are designed for long term, prolonged use with a high capacity for endurance. They contract for long periods to support us when we sit or stand for prolonged periods. They control the fine movements that occur between vertebrae. The transversus abdominus is responsible for drawing in the abdominal wall and increasing pressure within the abdomen thus stabilizing the spine while the multifidus are responsible for finely adjusting vertebrae with small movements. The pelvic floor muscles also play a role in support of the spine. This middle layer of muscles provides the majority of the low back stability by preventing excessive bending or rotating of each vertebra. These are anticipatory muscles, meaning they activate before any actual body movement occurs. With injury to the lower back there is a delayed activation of the transversus abdominus thus inhibiting the stabilizing function that it normally has. Injury also causes a decrease in the level of activity of these muscles as well as a loss of muscular endurance in these muscles. These changes can occur within as short a period as 24 hours post-injury. It is important to realize that these muscles will not reactivate on their own. Your must retrain them to prevent recurring injury. 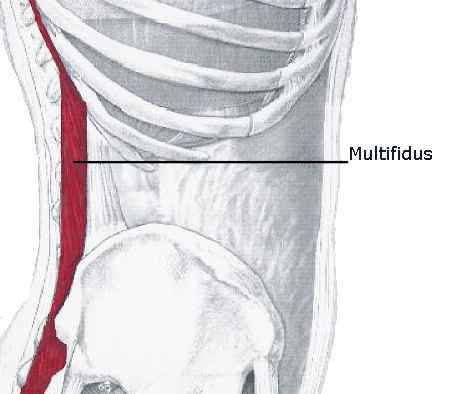 Other muscular systems also add stability to the spine: the latissimus dorsi and the gluteus maximus on the opposite side connect by way of the thoracolumbar fascia, the internal and external obliques and the hip adductors on the opposite side connected by way of the anterior abdominal fascia. Neural control centres provide sensory feedback from both systems and are responsible for the timing of core muscles that support the spine. When you go to open a heavy door, a coordinated, well timed sequence of muscular contractions occur in your back to provide your spine with the stability you need to open the door. If you damage your back through a lifting injury or car accident, your ligamentous support system is damaged, therefore you need to use your active muscular support system (core muscles) to stabilize your spine. That involves not only strengthening but also coordinating and re-educating the surrounding musculature. The muscles' ability to contract and maintain stability depends on the speed and accuracy with which the information from joints and stretched ligaments is relayed. The important aspects of neural system development are therefore accuracy of movement, and speed of the reacting muscular contractions.